TESolution has acquired ISO 9001:2008 on 1. Civil Engineering and Wind Tunnel Test Services and 2. Design, Development, Fabrication, Installation, Maintenance, and Servicing of Vibration Control System. TESolution has acquired ISO 14001:2009 on 1. Civil Engineering and Wind Tunnel Test Services and 2. Design, Development, Fabrication, Installation, Maintenance, and Servicing of Vibration Control System. 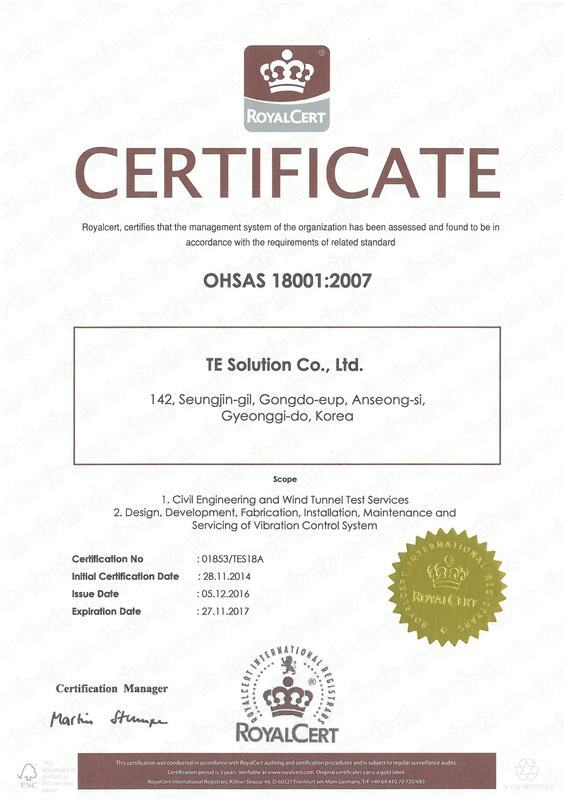 TESolution has acquired OHSAS 18001:2007 on 1. Civil Engineering and Wind Tunnel Test Services and 2. Design, Development, Fabrication, Installation, Maintenance, and Servicing of Vibration Control System. 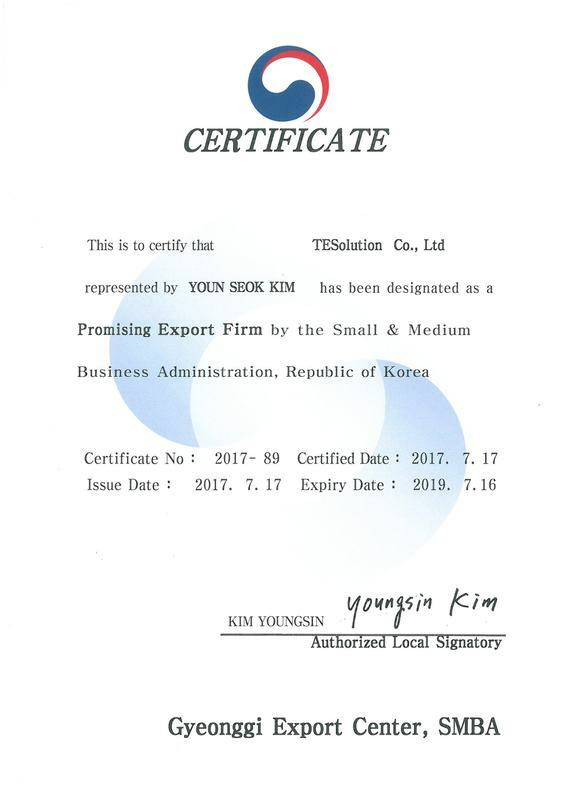 TESolution has been selected as a Promising Small and Medium-Sized Enterprise by the Gyeonggi Provincial Government in Korea. 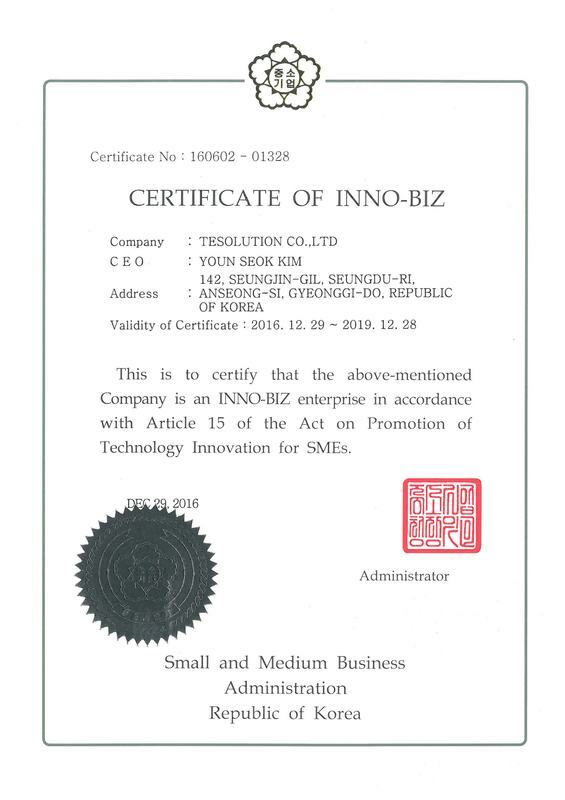 TESolution has been selected as an INNO-BIZ Enterprise by Small and Medium Business Administration in Korea. INNO-BIZ is a word combination of Innovation and Business and it is a certificate that is presented to small and medium sized company with technical prowess who are competitive in the market. TESolution has been chosen as Promising Export Firm for the 1st half of 2017. Promising Export Firm is a program run by Gyeonggi Export Center to find small and medium sized firms with high potential for growth and provide support to raise them to become expert firm at export. TESolution was chosen based on several criteria such as potential for export growth, its ability to produce more export income, technologies, and financial status.